You may remember an experiment I tried a while back, pairing a forgotten bookmark with a short piece of fiction. I thought it would be fun to try again. I hope to post a few of these in the coming days. The first piece is by Jessica Fortunato. She chose to write about this find. I'll re-post the images, story to follow. Hollie perched upon the worn window seat. It had rained for days, and reading was all there was to do. Reading and missing her Papa. He had sent her to England to live with her Grand-mère three years earlier after her Mother’s sudden passing. To lose one parent is painful. To lose two filled Hollie with a feeling of longing that words cold not describe. Words, her Grand-mère had always told her, were the key to life itself. Hollie had not received a letter from her Papa in over a year. 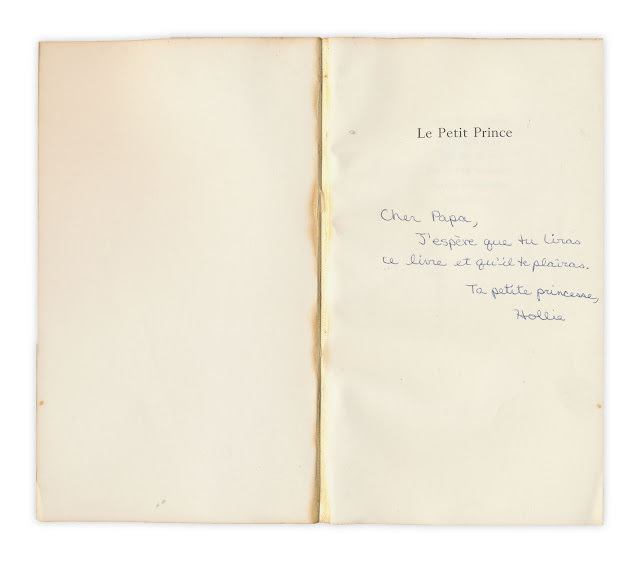 She begged, pleaded with her Grand-mère, just allow her to write him once, yet she was always denied. As she stared at the rain, she decided tonight would be the night. She would sneak into the study and find an address. It seemed to take ages for Grand-mère to turn out her light, and even then, Hollie allowed plenty of time for her to fall asleep. To pass the hours Hollie finished reading the new book she had received as a gift the month before on her 12th birthday. Le Petit Prince was a funny sort of story. For such a Little Prince, he knew much more of the world than Hollie did. 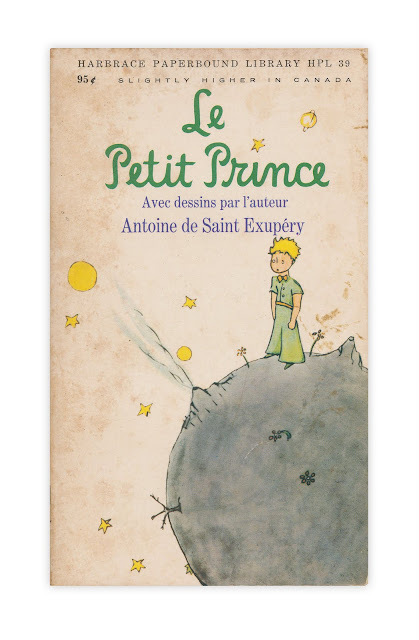 The author Antoine de Saint-Exupéry could weave words in such a way that her heart beat faster with each page, and as she finished the story, she found herself weeping in the night while feeling wrapped in love. Finally, she felt it was safe enough to go to the study. There she retrieved stationary and tried to write. All the feelings she had, all the things she wanted to do, the knowledge she’d learned. Her hand froze over the paper, and once more, she began to weep. With blurred vision, she searched through her Grandmother’s papers, until finally she found it. Her Father’s name and an address Père Lachaise, Paris France was scrawled on a scrap of paper. She copied the address, it was incomplete but she knew it would get to her Father. After thinking all night, Hollie had decided exactly what she was to send. She marched with the confidence of a girl much her senior to the post office down the street. There she paid to have the paper wrapped package sent to her Father Albert, at the address she’d found. The young man took her money, and tossed the package into the bin for delivery. Hollie skipped happily home. The kindly old woman working at the Laposte in France picked up the small package and read the address. This would be undeliverable she thought shaking her head. For Père Lachaise was a Cemetery, everyone knew that. With no return address, the package sat on her desk for weeks, until her curiosity overwhelmed her and she opened the wrappings to reveal a book. She opened the cover to reveal the inscription, and tears welled up in her eyes.